ERS now includes a new live dashboard display tab where you can create and customize dashboards to fit your company's needs. Create as many dashboards as you need and run them all live in parallel. Create your dashboard with a set number of slots. Then drag and drop customizable widgets into place. Simply configure the data source and the results you would like to display and ERS will do the rest. You can change the colors, styling, or the type widgets you would like to see. You can also mix and match as many as you want on the same dashboard. 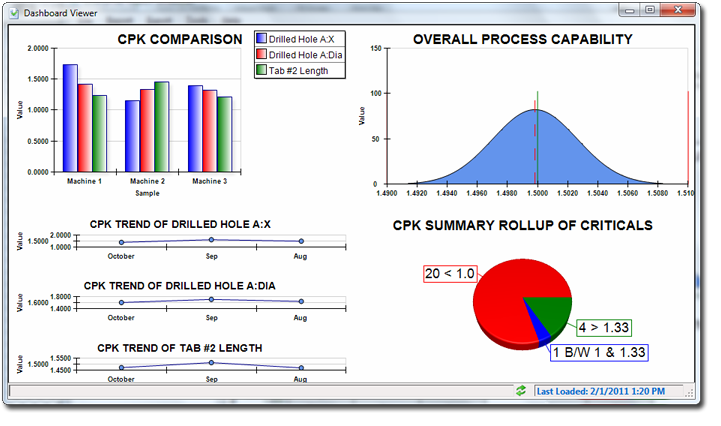 Add histograms, trend charts, XBar & R, pie charts, comparison bar charts, and various gauges. It's all a few clicks away! Dashboards can be saved as image files whenever they refresh allowing you to post them on visual factory overhead displays or other marquees. Use them as inserts in your intranet or internal portal website for instant metrics on your most critical features. 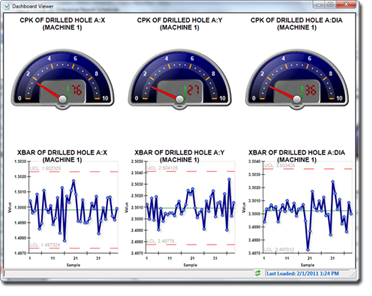 Use a dashboard to monitor the floor or a particular line by placing control charts side by side. Compare different machines or lines, watch long term Cpk/Ppk trends, or use the images for business presentations and customer reports.